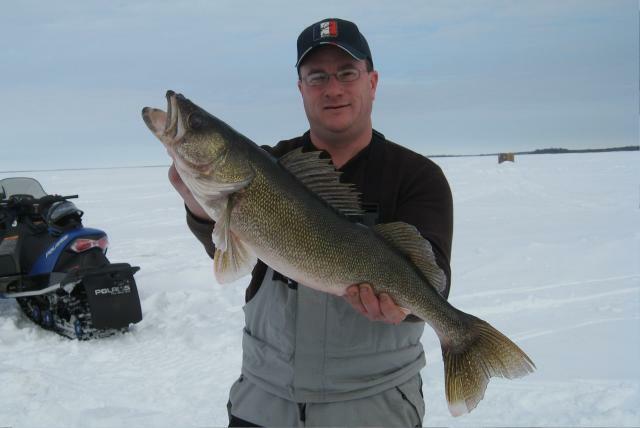 Ice Fishing Lake of the Woods - this is a great Ontario Ice Fishing Lake. 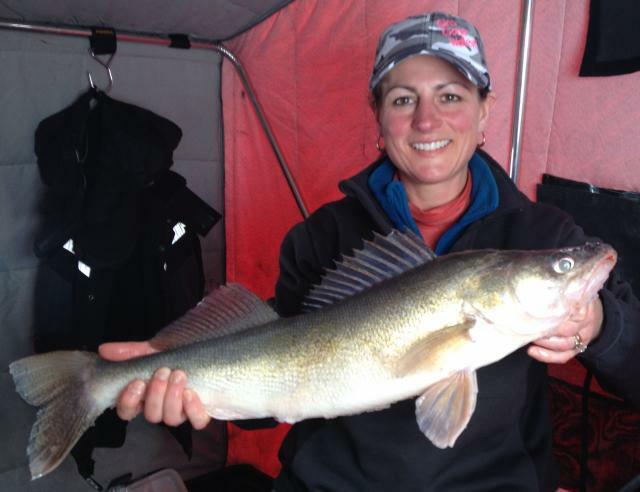 We offer ice fishing packages at our Lake of the Woods ice fishing lodge with heated ice shacks (ice huts / ice shanties) and modern comfortable (warm) cabins. Fishing, ice fishing for Walleye, Pike, Sauger, Perch, Bass, Muskie and Crappie on Lake of the Woods, Ontario Canada. Ice fishing is exceptional here. Great winter fun in Heated Ice Huts. 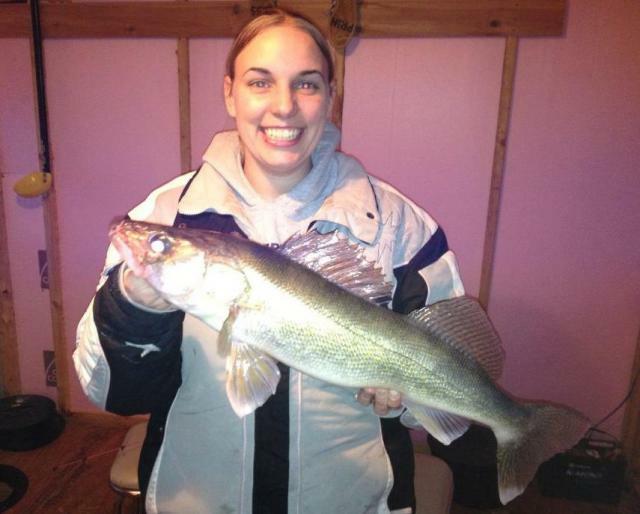 Ice Fishing and Snowmobiling are popular sports during the winter months. The ice often reaches 4 feet deep or more, making those areas on our frozen Lake of the Woods a great place for winter sport activities and family fun. 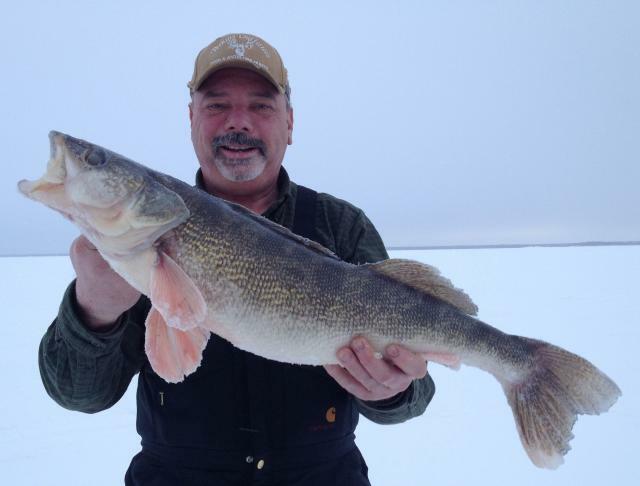 Enjoy snowmobiling while you are doing some Ice Fishing on Lake of the Woods! 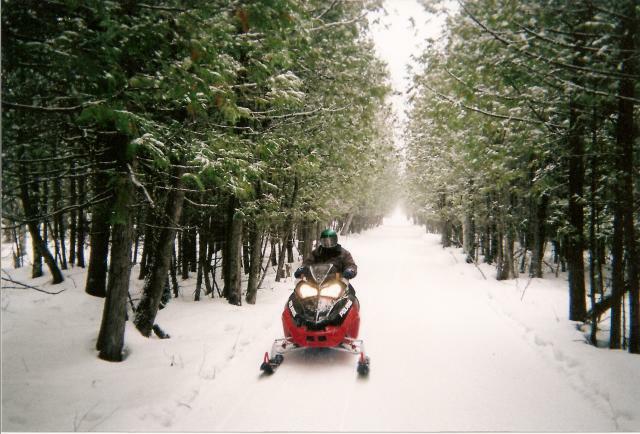 Snowmobile Ontario Groomed Trails. Harris Hill Resort is right next to a Main snowmobile trail - groomed trails that lead from USA to Nestor Falls, to Manitoba and back to the USA or Ontario again. We are also nearby to groomed "community" trails that lead into the main trails as well as nerighbouring towns. 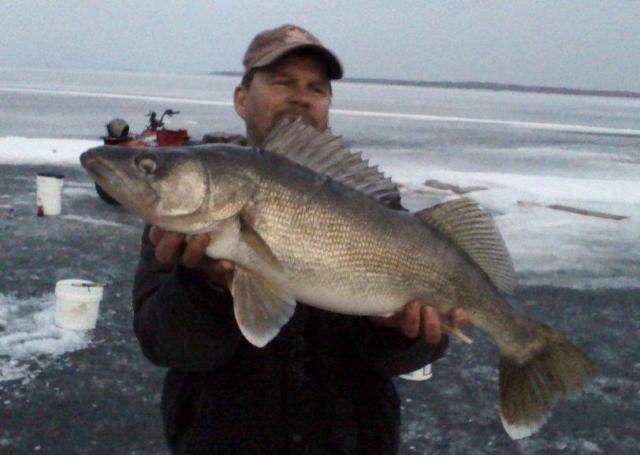 At most times you can readily catch your limits of Walleye and Sauger, while ice fishing Lake of the Woods in our comfortable heated ice huts, (ice shanties) or ice shacks as we Canadians call them. 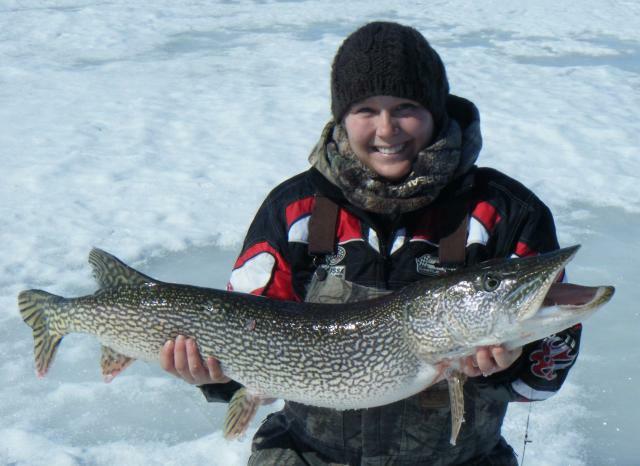 Many Northern Pike are also caught on Lake of the Woods during the winter fishing season. Black Crappie Fishing is always fun and exciting: Driving out on the ice and fishing in the warm sun makes it a great advenrture and a memorable day of fishing. We can direct you where to snowmobile or trailer out to another area for Black Crappie, or to another area for Trout. These are scenic rides to popular areas where these species of freshwater fish are readily found. Although we generally ice fish in warm comfortable heated ice huts, on a warm sunny day it is often preferable to actually sit outside and enjoy the warmth of the sun and take in the fresh air and the view of the lake and the Bald Eagles looking for lunch. With 4 feet of ice you can drive your machines right out on the ice to your favorite ice fishing spot. 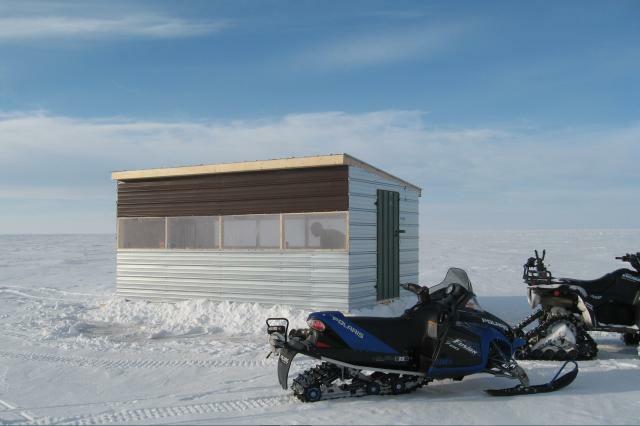 Our 10 ' X 16 ' Ice Huts are of Wood & Tin construction with 12 or 14 ice fishing holes, 16' windows on both sides, chairs/seats and a wall mounted LP propane heater in them. 10" holes. With 12 - 14 ice fishing holes you can have Six or Seven fishermen with two holes each, or up to as many people as you want ice fishing in this heated ice fishing shack. You can have as many people in our ice huts as you are comfortable with. For Ontario Ice Fishing you are allowed two poles each, unlike fishing in summer you may only have one rod & reel. 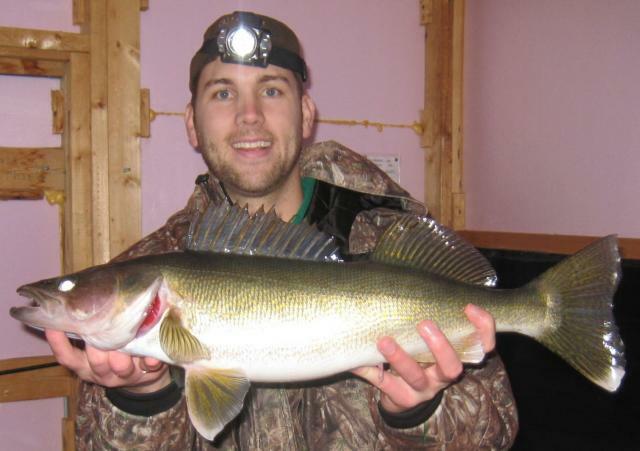 Ice Fishing on Lake of the Woods is a popular sport especially teamed with snowmobiling and a warm cabin to return to. heat, Satellite TV, running water, toilet, shower, BBQ etc. American Plan Meals or selected meals can also be arranged and served at our main lodge for your convenience. Please see our "cabin section" of our web site for all the details about our cabins. You may also bring your cross-country skiis, snow shoes and snowmobiles to enjoy the great outdoors and trails. Snowmobiling and sight seeing is a great way to spend a winter's day. You can visit 2 lighthouses by snowmobile. Go sight seeing, have fun. Enjoy Winter. View the many species of birds in our area both by the lodge and out on the lake like the Bald Eagles. Certain species of animals can be seen during the winter months, like the Otters on the Lake, Whitetail Deer that come in the yard, and Moose on the Islands, Fishers etc. Your arrival time for your cabin is 2 PM on the first day, and departure is 9 AM on your last day. Other times may possibly be arranged. We have Wireless Internet & Cell Phone capabilities. A picture may be taken for you that you can take back with you, or mailed to you after professional developing. You will have a heated ice shanty, with chairs, LP propane heat etc. Add meals to your stay. All meals or choose which meals you would like. 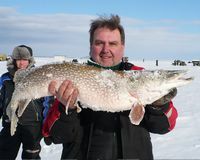 You may also arrange to have an experienced Ice Fishing Guide. You may arrange to have your fish cleaned, packaged & frozen for you to transport home. Pets are not allowed in the winter as they cannot be left alone in the cabin, sorry.